“It is the worst hour and a half of your life that you’re going to have, having an event like this,” Minneapolis Fire Department Chief John Fruetel said to a gathering of local officials and business leaders at Warehouse 23 in Vancouver Dec. 18. From the vantage point of the event space overlooking the Columbia River and the Interstate 5 bridge, he talked in detail about the harrowing trial of Aug. 1, 2007, when the then-assistant chief was handling operations of the deadly Interstate 35 West bridge collapse in his city. Fruetel played a frantic call into dispatch coming in at 6:05 p.m. that day, notifying of the bridge collapse. Within minutes he had assumed command on the nearby 10th Avenue bridge where he had a good view of the the unbelievable scene of close to 2,000 feet of bridge lying in the river. The bridge had fallen during rush hour while it was full of cars, with Fruetel remarking that he didn’t know whether there were 10 or 200 people in the Mississippi River below. Fruetel mentioned several complications during the hours following the collapse. He recalled contact with the Emergency Operations Center (EOC) set up farther away from his post, receiving information that part of the bridge had landed on a railroad car transporting chlorine and could be a safety risk. Recoil from the collapse may have also given part of the bridge an electrical charge when it came into contact with electrical lines and there was a propane leak on the other side of the river after part of the bridge severed a line. “They just kept throwing one thing after another on us,” Fruetel remarked. Overall 13 people lost their lives in the disaster and more than 100 received injuries from it. For weeks following the initial collapse there was the threat of secondary collapses as concrete kept spalling off. Fruetel explained that due to the way the bridge collapsed, motorists packed on the highway fell 75 feet into the water before the bridge came on top of them. As to a cause, Fruetel said it was due to inadequate gussets — plates used to connect beams — on the then-50-year bridge. The talk of the disaster was especially poignant given the location and those gathered. Clark County’s own problem bridge was in full view and several of those gathered for the event were lawmakers eagerly seeking a solution for the I-5 bridge that has been the source of traffic issues that have only ramped up in the past several years. Local officials tied to the bridge were also present to provide commentary on Fruetel’s talk. When looking at similarities, WSDOT Region Administrator Kris Strickler pointed to the age of the extant crossing, with one of the I-5 spans being 100 years old and the other close to 60 years old. Strickler explained that the current I-5 spans are listed as “functionally obsolete,” meaning that the bridge does not meet modern design standards. That differs from “structurally deficient” which the bridge in Minneapolis was. That said, a disaster such as a seismic event would still be catastrophic, structural deficiencies or not. Strickler said there was a 70-foot liquefiable layer of soil underneath the bridge foundation, presenting a “significant seismic risk of liquefaction” during a seismic event. That information was found in a recent inventory of previous work on what was the Columbia River Crossing project, a bridge plan between Oregon and Washington that in 2014 had failed. The inventory was conducted by WSDOT as part of legislation passed this year establishing a joint legislative committee that will ultimately consist of both Oregon and Washington lawmakers to work on a replacement for the I-5 bridges. Southwest Washington Regional Transportation Council Executive Director Matt Ransom noted that overall doing something about the I-5 corridor was on most officials’ minds. “I’d say simply there’s no lack of consensus that something needs to be done; that’s very clear,” Ransom said, adding that an I-5 replacement ranks as a leading investment in the RTC’s transportation plan. Ransom noted that the need for replacement dated back decades, referencing a report prepared for the state Legislature in December 1988. Since then there had been multiple instances of regional plans with the most recent concluding in 2004. From Ransom’s perspective one of the major issues was timing, using the analogy of having windows of opportunity. He said back around the turn of the millennium when he was working with the city of Vancouver there was an opportunity, though nothing ended up coming from it. Fruetel also stressed for legislators to put in work on getting a replacement for the bridge, noting that infrastructure was vital regardless where one sat in respect to the political aisle. “They carry everybody. It’s a bipartisan deal,” Fruetel said. 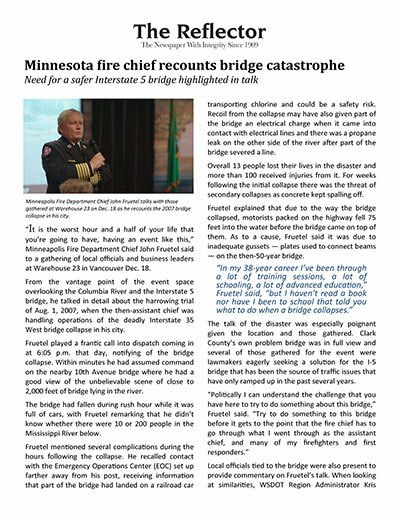 First Responders recall the rescue and recovery efforts associated with the 2007 I-35W bridge collapse, available here. A tribute to those who perished in the I-35W bridge collapse can be viewed here.